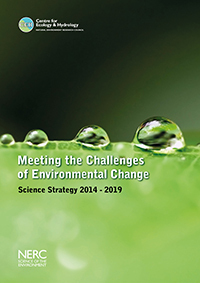 of CEH’s new Science Strategy, Meeting the Challenges of Environmental Change, 2014-2019. The strategy was published this week and addresses three major societal and environmental challenges: securing the value of nature, building resilience to environmental hazards, and managing environmental change. 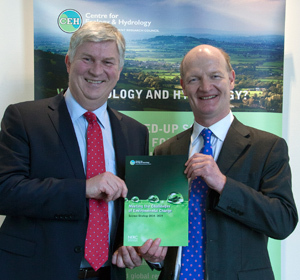 During his visit the Minister discussed CEH’s research portfolio, held discussions with senior staff, and met with a number of scientists who presented work on flood forecasting, biological recording, pathogens and soil moisture monitoring; seeing at first hand how CEH’s interdisciplinary environmental research delivers social, economic, and environmental benefits. To implement the strategy CEH has established a number of Science Areas, which will make our science and researchers even more accessible to all stakeholders, and further underpin the relevance and impact of our long-term research, including the evaluation of land surface-near atmosphere interactions. CEH continues to carry out independent, impartial science working across disciplines and facilitate academic, public, private and voluntary sector partnerships, remaining focussed on providing early warnings of change and management solutions for our land and freshwaters.